For the past half an hour, I am typing… and deleting as I type. I am not sure how to start the post. It has been than a year now since I blogged here the last time. A lot of changes have happened in the past that can account for my absence in the blogging world. I am a mom now and that explains it all. And talking about the review of this book - Stolen Hope by Shubha Vilas - it should have been posted long ago, a year ago to be precise. 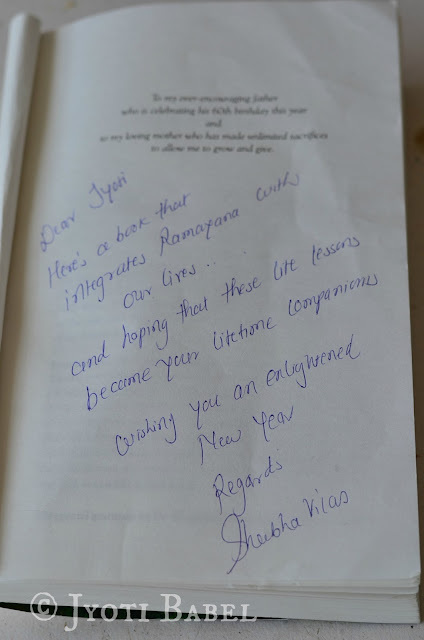 Here is a picture of the New Year message the author had jotted down on the signed copy for the year 2016 and here I am posting the review in 2017. My sincere apologies to the author for not being able to do it sooner. As a reader, I love reading books on Ramayana and hence, even after the inordinate delay, I couldn’t live with not posting a review of this book in particular. So, here I am here with a quick review. Re-telling Ramayana is a mammoth task and the author is doing it with utmost dedication and sincerity. 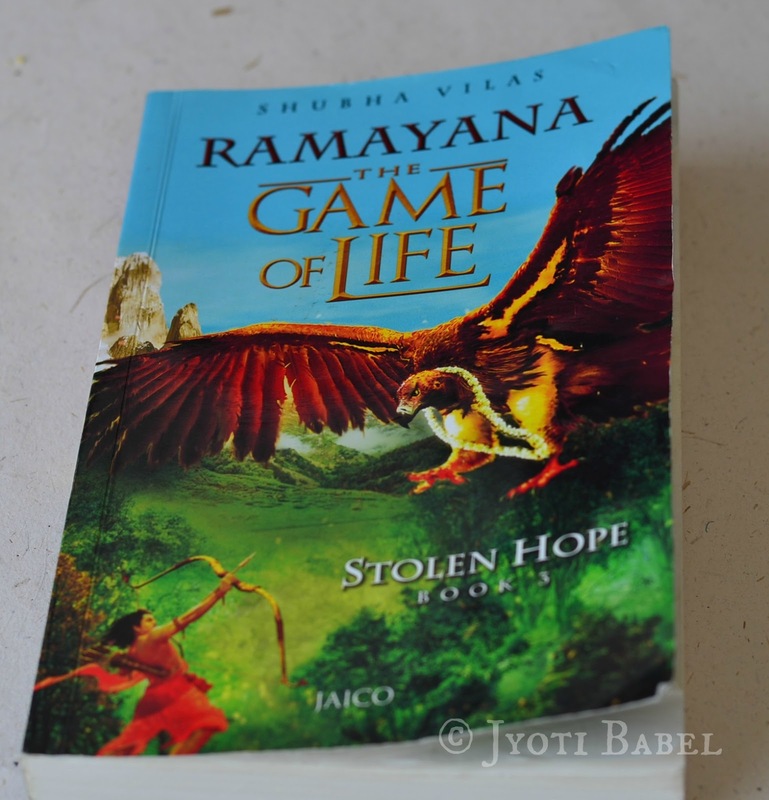 This is the third book of the Ramayana series - The Game of Life by the author and you can read my review of the first two books - Rise of the Sun Prince (Book1) here and Shattered Dreams (Book 2) here. In his series of Ramayana, the author has tried to stay true to Valmiki Ramayana. As you read the book, you will realize how much research has gone into the writing it. I came across many unheard-of small tales which made the reading experience even more enriching. The writing style is lucid and engrossing. Everything is described in such detail that you could imagine it happening in your mind. The foot notes by the author are gems of wisdom. Just reading the book as you would read any other novel won't let you understand the crux. You have to go really slow with the book- absorbing the meaning and how the values it teaches holds good in our lives from the foot notes. At times, it does feel that they are disrupting the flow of the story. I too had such moments while reading the book and so, I would re-read chapters again. That is the beauty of Ramayana; you can read it again and again without getting bored. Another beauty of the author's writing style is that every character bloom and shine in his words. Every character, even the tiniest ones, gets their due share of space without being overshadowed by the main characters. That is the hallmark of a great story teller. If you love reading books on Ramayana or Indian mythology, this series of books is a must have on your book shelf. Some lessons in crisp lines quoted from the book. Historical travel creates road maps. The depth of contribution, the height of value system and the width of tolerance determine the real size of a human being. Responsibility is not a choice, it's an honor. Fame is like riding ocean waves. In the absence of somebody's presence is revealed here true value. What presence cannot accomplish absence can. Real faith is not about having insane, intense belief for a short duration but about having progressively increasing conviction for a longer duration. Righteousness is like a surf board that keeps you afloat even in the midst of shifting tides of immorality.